Catlin Gabel is proud to share the Guide to Facilitating Youth Civic Leadership by Erin Goodling ’99 and George Zaninovich. 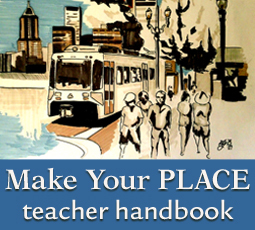 This 121-page guidebook below is an outgrowth of Catlin Gabel's PLACE urban studies and leadership program. We are pleased to expand our reach and share this curriculum with educators, activists, community leaders, and, above all, students. The book and webpage are fluid resources for you to use in your classroom or workplace to help empower youth to be leaders for positive change. You may borrow and adapt as you see fit, and we will publish chapter updates when possible. The evolution of this book has been, and will always be, reflective of youth, peer, and community leader participation. Please stay in touch, alert us to new information, share the link with others who may be interested, and provide feedback on how these resources can be improved. Before using this guidebook, please complete the short user guide sign-up form so we know how the book is being used. This information will help us to revise and add in the future. We promise: no spam, no cookies, and no sharing of your information. Flip through the digital book (takes a few seconds to load) to view or download the PDF. Please attribute or cite when using or reproducing. For more information, contact George Zaninovich at place@catlin.edu and follow on Twitter @PLACE_PDX.